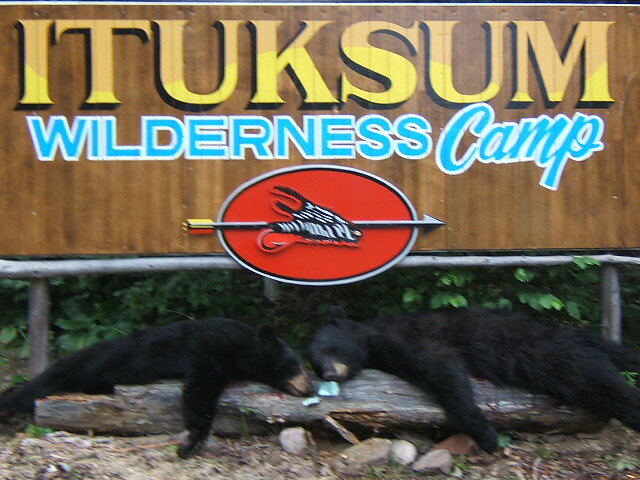 Rifle and Bow hunters alike will enjoy the solitude that Ituksum offers for their trophy hunt. Wildlife of all kinds could be seen at your treestand. Moose is the big game most often seen by our hunters along with lots of other wildlife. Not being bothered by road hunters or locals is a big plus when you have spent all year in busy situations with lots of people. The remoteness of Ituksum guarantees this. Bear Hunting Season starts Aug 15th and runs through till Oct 31st. All hunts start on Sunday. Hunters are expected to arrive on Sat. around noon, unless different arrangements have been made by us. The afternoon is for set up and check in. 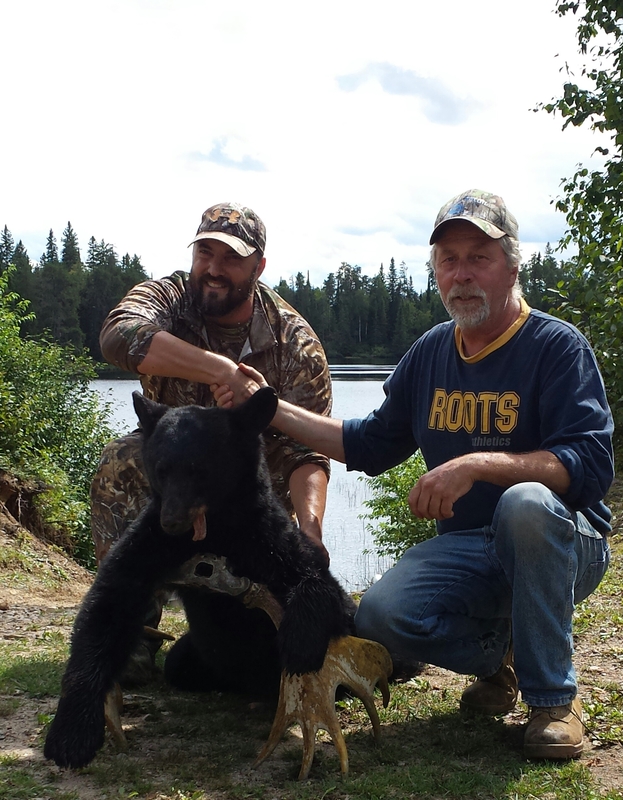 Make sure you have your licences, including your fishing licence, if you plan to fish after getting your bear. All baits have been pre-baited for 4 weeks and are guaranteed active. We will help with tracking, field dressing and transporting your Bear back to camp. We will lead the skinning team and have the meat and hide frozen for you. We have a tree stand setup in camp with a target to simulate the real thing. 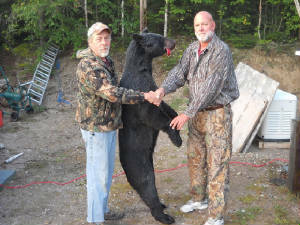 Our success in showing Bears to hunters over the years is 95% In the last 2 years we have had 8 weeks at 100% harvest. Putting a hunter on an inactive bait does nothing for my reputation or your success. My aim is to provide you with the best hunt possible, with the intention of keeping you as a valued client and future friend. A Hunting Licence purchased along the way, make sure you have a old or current licence from your state, so you can purchase your license along the trip here. A couple sets of Camo, hunter red hunting clothes, that should be worn to and from hunting area, rain gear, rubber boots, bedding (sleeping bag) pillow, food, personal items, dish soap and dish cloth, toilet paper, camera, tree stand, ATV, if you wish to bring one. ATV's that are brought into Ontario, laws are the same as your own state, helmets are manditory in Ontario. Fishing rod and fishing gear , if you wish to fish after your success in the hunt for the duration of your stay. 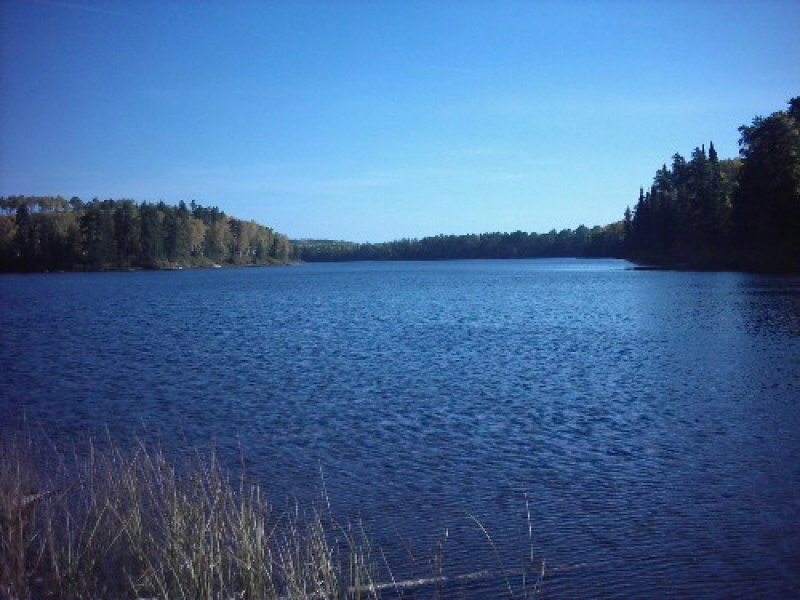 We offer accommodations for moose hunting, whether it be bow or rifle, as well as bird hunting and sight seeing, we have a lot of ATV roads available for riding and hunting, we do not rent ATV's, so bring yours with you. All mattresses covered with top sheets. 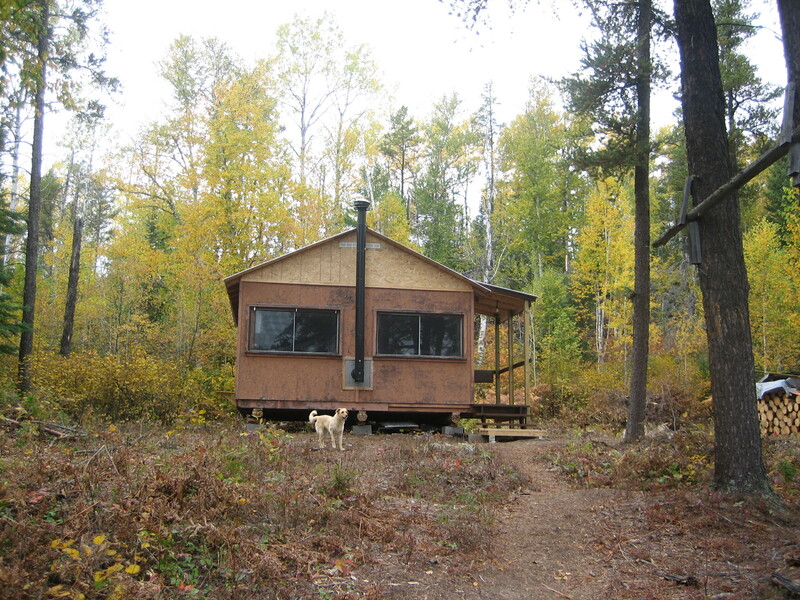 Cabins available for moose, bear, small game hunting as well. 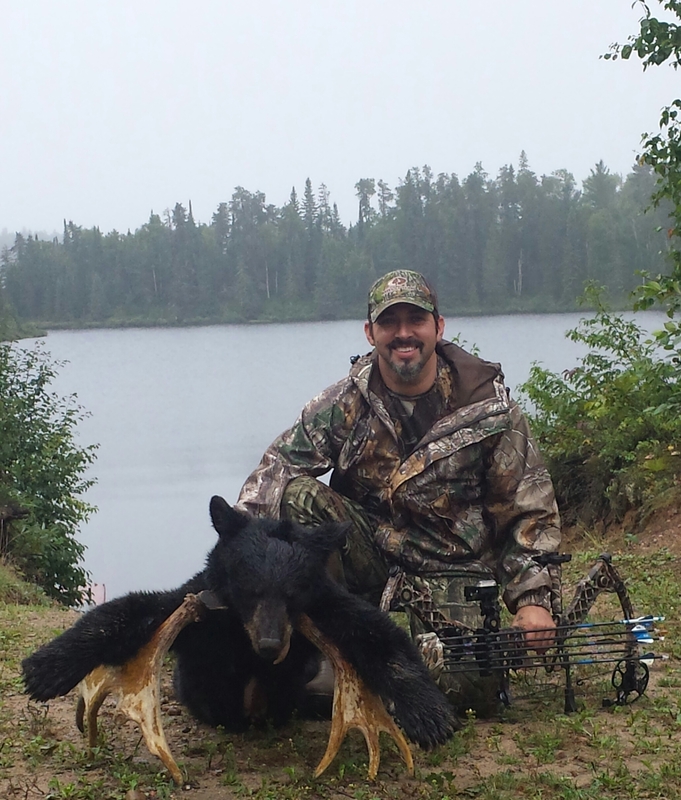 We have the best area available for moose hunting as well as bear. Weekly rental comes with one boat per cabin, motor not included. 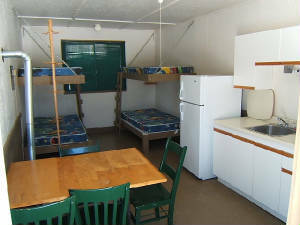 Camping rates are $40.00 per day or $200.00 per week, per Camper or Tent. Camp sites can accommodate, Tents, Campers and Motorhomes. 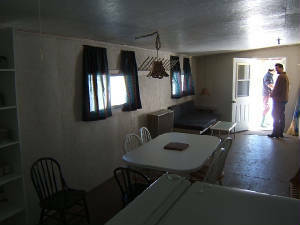 No water or electrical hook up, one shower a day/person provided with campsite, and fresh drinking water supplied.